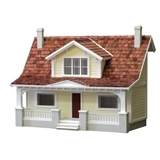 Build the miniature house of your dreams with our 1/24 scale dollhouses! 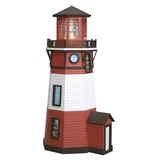 Whether you’re looking for an impressive mansion, a rustic farmhouse, or something more exotic (maybe a lighthouse? 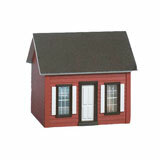 ), Miniatures has the mini dollhouse kit for you. 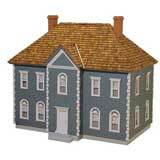 Try assembling one of our unfinished kits and using it as a canvas to build your perfect dollhouse scene! 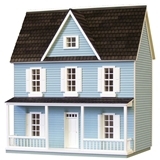 1/24 scale dollhouses stand smaller than their 1/12 scale sisters – while 1/12 scale means that something that’s 12” long in full scale is 1” long in miniature, 1/24 scale is half that size. (That means this hypothetical object would be half an inch long!) 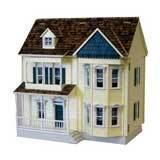 That means these mini dollhouse kits take up less space in your home. 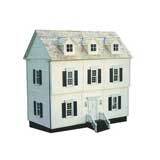 More space for more dollhouses? Or just a way to realize your most miniature dreams? That’s up to you. 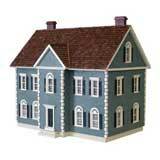 With our 1/24 scale dollhouse kits, it’s easy to get started on your own dollhouse project. 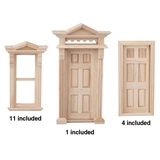 Keep in mind that these kits are mostly unfinished and unassembled, so you will need a little bit of elbow grease and some paint to build this house! We think it’s worth it, though. 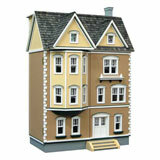 Take a look at our collection of mini dollhouse kits and find the miniature home that’s right for you. 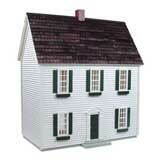 Or take a look at our 1/48 or 1/144 scale miniatures!